The WaterMaker Five is one of the most popular residential reverse osmosis systems available. The WaterMaker Five is a 5-stage reverse osmosis system featuring a four-stage prefilter, membrane and postfilter in one cartridge with the fifth stage carbon filter placed between the tank and faucet for even better tasting water. 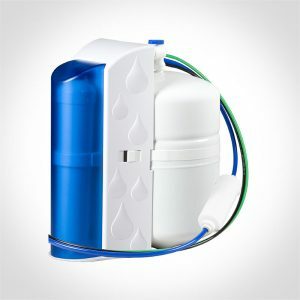 The WaterMaker Five utilizes a high capacity sediment prefilter to remove suspended solids such as dirt and salt. The granular activated carbon (GAC) prefilter removes chlorine taste and odor. The 50gpd reverse osmosis membrane removes salts and other impurities, and the GAC postfilter provides fresh, clean drinking water. If you’re looking for a reverse osmosis system in Jacksonville, Nocatee, St. Augustine or surrounding North Florida communities, call Dave at All Florida Soft Water. We are Jacksonville’s leading water softener and reverse osmosis system provider because we provide exceptional service, great prices, and the best products available. The WaterMaker Five uses the latest in system design and membrane technology to reduce the amount of water down the drain by 50%. The WaterMaker Five (WM5-50) has been tested by The Water Quality Association against NSF/ANSI Standard 58 for the reduction of TDS, arsenic, cysts, fluoride and lead.